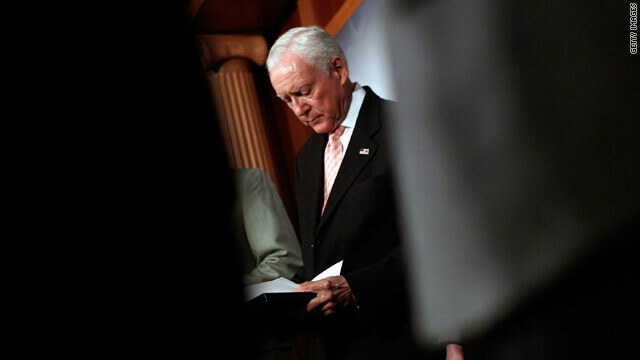 (CNN) – Utah Sen. Orrin Hatch said Tuesday if he is reelected to a seventh term, it would be his last. The Republican made his announcement at a Salt Lake City press conference covering land management in Utah. "I was a leader of the Sagebrush Rebellion that started during my first term in the Senate," Hatch said at the event, according to a statement from his campaign. "The state has made it clear that they expect the land to be conveyed by the end of 2014. I want to see the transfer of land happen, and the end of the need for a Sagebrush Rebellion, during my last term in the Senate." Hatch has faced pushback from the right in his bid for a seventh term in Washington, including two Republican challengers: former state Sen. Dan Liljenquist and state Rep. Chris Herrod. FreedomWorks, a grassroots conservative organization, has targeted Hatch, spending hundreds of thousands to help oust the 35-year Senate veteran. Hatch, who is currently 77, would be 84 in 2018, the year he would again be up for reelection. Yep. The GOP supports term limits. When the Koch Bros say you must go then you must go. Koch Bros, Norquist, Limbaugh are running the GOP. Has he served his state and the country well in the US Senate? If yes, then why shouldn't he be re-elected. I don't know if he has don't enough to deserve it, but he doesn't represent my state. A long time study said ties cut off blood to the brain and interfere with brain activity. His tie has been way too tight for way too long.